This message is about your personal mission as a wild woman entrepreneur. I call this mission your Soul Message, the inspiration that weaves through your offerings, blog posts, and overall rhythm as an entrepreneur. This is what you’re known for and stand for. It’s your legacy. I love working with women transitioning through the emotional ups and downs of the entrepreneurial path. The healing balm for all fear, doubt, and upset on this journey is getting clear on your Soul Message. When a woman is clear on her Soul Message, her inner and outer worlds go through massive shifts. Her wants turn to musts, her somedays turn to now, and her desires become nonnegotiable. When you find it, or rather, remember it, your Soul Message will carry you to new heights of creativity and inspiration, making the burnout, fear, and procrastination disappear. If you’re not inspired by your message, you won’t have the strength to get up and spread the Word. Soul messaging is about vulnerability, truth telling, and transforming your shame into self-worth. Every woman’s message has a different flavor, and yours is JUST around the corner. 1. Follow your desires. Your desires, message, and impact are all connected. When you receive your desires, a magnetic field of joy ripples around your business and your message becomes irresistible. Welcoming your desires help your soul come alive. Your desires are the roadmap to what you stand for and believe in. The trick is welcoming your desires without an ounce of shame. 2. Listen to your uncomfortable emotions instead of pushing them away. Your shadows carry your gifts, and will point you in the direction of your soul message. What makes you mad? What are you struggling with right now? Shine light on the darkness and find the gold in your struggle. You could very well teach, speak, and coach on the subject that you’re challenged by now because you know the ins and outs of this struggle more than anyone else. What would open up for you if you healed this struggle? What would open up for the world? 3. Picture your big break. This could be landing a TED talk, being featured on Oprah, or getting a book deal. What does your “big break” look like? What’s the topic? Who’s in your audience? Who are the big shots on your panel? What’s the title and tagline of your book? This final question is the most important one: Why is your audience showing up to receive your teachings? Why are they buying your book? What will they heal as a result of listening to you and your story? Have fun with these exercises! And please let me know how they go in the comments below. What opened up for you? Sending you TONS of love, and thank you for inspiring me to share MY message every week. P.S. These brainstorming prompts are just a few of the many exercises I offer inside a Mini Skype Intensive. Want to go deeper with me? Get on the phone with me inside a free discovery call. 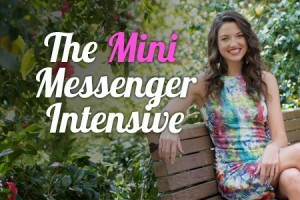 I’m still offering Mini Skype Intensives to help you find your message with clarity, conviction, and power. In just three hours you’ll walk away with the inner knowing and language to share who you are, who you serve, how you do it, and WHY. Click the image below to get on the phone with me. On this free 30 minute call I’ll share my signature Messenger process with you, and you’ll begin to uncover the blocks in the way of expressing your message. Then we’ll schedule your skype intensive crafted to your specific needs. This $997 offer ends next Saturday March 26th!